USHA has carried out a survey about First Aid payments being made at members Institutions. This took place March 2015 and there were 33 responses equivalent to 22% of association membership. The survey was coordinated by USHAs North East Regional coordinator Lesley Salkeld. View the comparison table here. The results of the 2013-14 UCEA sickness absence benchmarking survey are now available. The survey covered working time lost due to sickness absence for the period 1 August 2013 to 31 July 2014. When completing the survey, HEIs had the option to report sickness absence using either the existing UCEA categories or a new broader set of categories. It was hoped that the flexible two-level approach would improve the quality of data and number of participants in the survey. This move was an outcome of a review of the sickness categories in consultation with HEIs. The recommendations of the report below have been presented and accepted by the Health and Safety Committee. The Times Higher Education World Reputation Rankings 2015 employ the world's largest ‘invitation only’ academic opinion survey to provide the definitive list of the top 100 most powerful global university brands. Following enquiries made by Niamh Nelson - Head of Safety, Health and Wellbeing at University of Westminster…USHA members can take advantage of 10% discount on delegate rates if attending this year’s IOSH conference. Unfortunately the rate cannot be retrospectively applied to USHA members who’ve already booked onto the conference. Those members can however contact the conference’s bookings and enquire as to whether they can access other potential offers. They need to ensure they refer to USHA. Here are the full programme details and how to book your place. Following the meeting of the USHA Estates Asbestos Group in October of this year, it was decided to carry out a survey to determine how asbestos was managed in the Higher Education Sector. There was a good response to the survey, many thanks to all of you who took the time to fill it in, the survey also gave a god insight into the management of asbestos within the HE sector. - Over 50% of respondents have more than 2000 asbestos assets within their estate, however less than 50% have a dedicated asbestos manager on their payroll to look after the asbestos on their estate. - Nearly 70% of respondents carry out some asbestos management tasks “in house”. Of these 92% carry out project management of removals and 33% carry out asbestos surveys. None of the respondents carried out any air testing or bulk analysis. -60% of respondents have a dedicated budget for the management of asbestos within their estates. The information provided by the survey has been very helpful in gaining an insight into how asbestos is managed throughout the HE sector. This information will assist the Asbestos group greatly. To see a full copy of the survey results, please click here. The USHA Nano Group is affiliated with the UK NanoSafety Group. It has an ongoing commitment to encourage and improve best practices in nanomaterials safety. Knowledge of the British standard is important to anyone organising, or taking part in, an overseas venture. Click here to view the leaflet telling you about the changes Guidance in full. If your Institution has a subscription to BSI you can download the full guidance online. The UCEA Health & Safety Committee wants to gain a better understanding of why incidents occur within the sector, the lessons that can be learnt and for this to be shared amongst universities for the greater good. USHA members are being asked to submit details of any health and safety incidents which they feel others can use to reinforce or further promote successful health and safety management within their own university. Here are the background details. Concerning both the risks for students and university staff arriving in the UK from an affected country in West Africa (Sierra Leone, Guinea and Liberia) developing Ebola in the UK, as well as the risks to travellers going to West Africa. Click here for more information. Whilst attending the World Congress on behalf of the University of Brighton, Deputy Director of Health & Safety Andrew Knight presented a poster on the work of the work of the Fieldwork Project Group. The poster showcased the benefits of collaborative working with partner organisation UCEA and also promoted the development of sector guidance as a successful method of support a culture of prevention. University of Brighton Director of Health and Safety Alan Cowen met Dr Sedlatshek - Director of the European Agency for Occupational Safety and Health at the launch of a new OSHwiki system to share knowledge on health and safety across europe using the wikipedia platform. Alan identified that the system would be of direct benefit to students on degree courses when researching for facts on health and safety. Dr Sedlatshek welcomed a partnership approach to raising awareness within higher education. 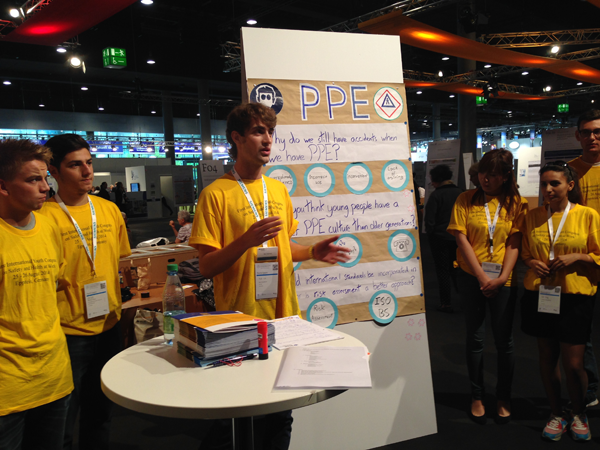 Pictured is Ben Hadman – University of Brighton Health and Safety Department ‘Undergraduate Project Assistant’ who attended the 1st International Youth Congress which ran in parallel to the main congress with presentations made by the students. 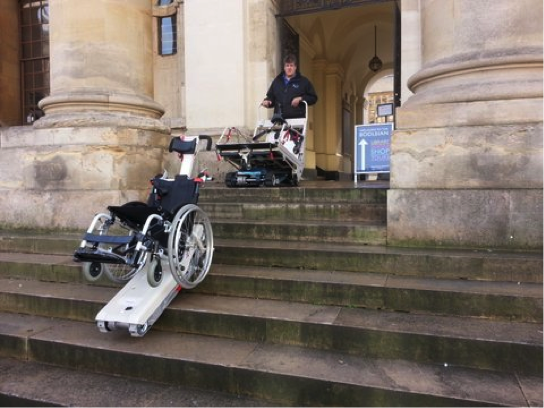 The recent survey* of Britain’s most visited tourism venues found that 63% are not fully wheelchair accessible, this is no surprise to SwallowEMP, the UK leaders in powered mobility and evacuation chairs. IS THIS TRUE OF UNIVERSITIES? The Equality Act is the key and people should be acting in the spirit of the Act, offering the best solutions for access, egress and evacuation. In our experience many can evacuate people from buildings but only have one design of chair for downward evacuation only, expecting wheelchair users to transfer into these in an emergency. Very few companies focus on ACCESS as well as EGRESS and cater specifically for wheelchair users. There is no need to transfer out of a wheelchair and one person can move people in wheelchairs both upstairs as well as downstairs. Swallow EMP - True Solution Provider and the leading supplier of powered Access, Egress & Evacuation Stairclimbers. Training is a health and safety essential, says Andy Smith, Sales Director at HSS Training. there are still too many incidences. According to Health & Safety Executive statistics, 27 million days were lost overall in 2011/12 due to work-related ill health or injury. Even more cause for concern is that in 2012/13, 133 workers died at work. While accidents will of course occur, there is little doubt that many of these fatalities could have been avoided if better care and attention had been taken. The truth is it’s everyone’s responsibility to minimise the chances of accidents occurring; workers must take due responsibility for themselves, managers must ensure adequate training is provided for all team members and those who supply equipment must ensure that it is properly maintained, that it is safe for use and that users receive training in how to use the equipment. Generally, people are aware of their surroundings (and surrounding hazards) and to some extent can use their instincts to keep out of harm’s way. However, accidents do still occur (as the figures above show) both at home and in the workplace an particularly in certain work environments and when equipment is bought into the equation – which is why appropriate training is an essential. As Sales Director at HSS Training, it is my job to make sure that workers remain safe whilst working with potentially dangerous tools or equipment, by providing them with the correct training to avoid would-be accidents. Financially, training saves you time and money. The initial output is relatively small when you take into account the benefits; fewer days lost due to ill health, a reduction in insurance premiums and a reduction in compensation claims. But this is all relative in comparison to the moral duties for employees’ health and safety, which should absolutely be the first priority for any employer or manager. By investing in training and formal assessment, you are investing in your workforce’s future – not only are you allowing them to complete their work in a more effective manner, you are also minimising risk to their health. The need for specialisation has resulted in a huge surge in the introduction of bespoke training schemes across the UK. Taking the important legislative regulations of the Health and Safety at Work etc Act 1974 into account, ALL employers must train their employees to satisfactory levels for the task at hand: “the provision of such information, instruction, training and supervision as is necessary to ensure, so far as is reasonably practicable, the health and safety at work of his employees”. Here at HSS, training is an area where we’ve seen considerable growth over the past few years. Alongside a comprehensive range of off the shelf training solutions for all scenarios, we've developed a number of bespoke training courses - marrying existing skills, customer needs and industry knowledge to produce pragmatic and user-friendly courses that complement the individuals job description and responsibilities. This has all been possible thanks to our close working relationship with those we have equipment hire contracts with. Our account managers take the time to understand their customers, and as a result are familiar with the ins and outs of their businesses and business needs. It is important that all training courses are officially recognised by an awarding body – so you can rest assured they cover all aspects of the training required in sufficient detail – particularly so given that proving compliance is becoming ever more important. Working closely with our clients, The Health & Safety Executive and awarding bodies, we have developed a suite of over 240 courses across areas such as; Workplace Safety, Work at Height, Health & Safety, Rail and Industry Passport Schemes – all of which are officially recognised by the appropriate and official awarding body. Our H&S courses have been formulated to cover anything from harness training, first aid, working in confined spaces and safety management and are developed to respond directly to workers’ needs. We can deliver these courses at one of our specialist training facilities, or on site. To complement our tutor led courses we also offer a range of e-learning courses, 72 titles in total, these are designed to support and enhance the learning process. We refer to this as ‘blended’ learning, meaning we provide practical tutorials alongside e-learning modules, to ensure the most efficient and effective ways to learn. By undertaking a piece of individualised learning, employees can apply theoretical health and safety knowledge into every day practice – by synergising nature and nurture, through efficient and pragmatic processes, training professionals can work towards reducing injuries at work and improving health and safety records. As affiliate members of USHA, we want to support as best we can to ensure safe practices are carried out in the workplace. We want to work with you to reduce the number of work place accidents, making your facilities a safer place for everyone that uses them, so if you have a question, please don’t be afraid to ask!